At first glance, a pile of dirty laundry might not look like a source of fresh ideas for an academic with a deep-rooted interest in social justice. 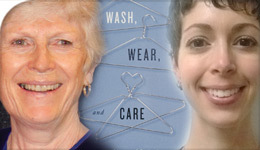 But when Pat Armstrong started rummaging through sacks of sweaters, socks and silken nothings awaiting washing in nursing homes scattered across six western world countries, the Distinguished Research Professor in the Department of Sociology at York University uncovered layers upon layers of hidden sociological meaning behind garments belonging to their elderly residents. 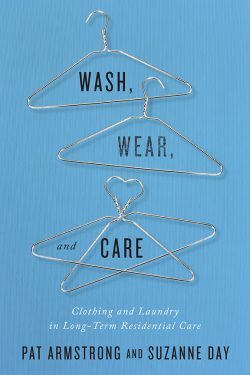 “Clothes are important to creating a sense of self, and a sense of dignity, and so how you care for them matters,” says Armstrong, who has published a book on the topic following eight years of international research into the importance of laundry.Co-authored with York PhD graduate Suzanne Day, Wash, Wear, and Care (McGill-Queen’s University Press) argues that clothing is more than just fashion. It exerts a critical influence on the morale and health of senior citizens living in institutional residences. For the occupants of old people’s homes, clothes often represent the last shreds of self-respect to which the elderly cling after everything else in their lives has shrivelled and died. Clothes express not just ideas about identity, but often existence itself. Armstrong learned this firsthand while leading an international team of ethnographic researchers into nursing homes across Canada, Sweden, Norway, Germany, the U.S. and the U.K.
Far from observing their subjects from the comfort of the ivory tower, Armstrong and her fellow scholars divided themselves into groups of between 12 and 16 members who took turns doing shift work inside the facilities within their purview. They did domestic labour, sweeping floors and serving meals, while keeping their eyes glued on the ever-pervasive piles of laundry that constituted the bulk of their primary research. The researchers didn’t just observe; they interviewed staff as well as residents and their family members about the handling of clothing within an institutional setting. They wanted to understand how a seemingly mundane task as doing the laundry can profoundly affect the physical and psychological makeup of the elderly in care. Miranda Ferrier, president of the Canadian Support Workers Association, knows firsthand the importance of clothing to senior residents of long-term care facilities. “I took care of one lady who knitted a red sweater for herself before she went arthritic and it was her crowning achievement and then the sweater went missing and she fell into a deep depression. Yes, over a sweater. But the point is it had incredible value to her,” says Ferrier who, while not a part of Armstrong’s study, agrees with its findings. Nathan Herrmann, the Richard Lewar Chair in Geriatric Psychiatry at Sunnybrook Health Sciences Centre and the University of Toronto, agrees. “I am the psychiatric consultant for the Veterans Centre at Sunnybrook, a long-term care facility, and there is no question about how important clothing is to the residents. There are many examples of 90-year-old male residents who must be dressed in a jacket and tie on a daily basis, even if they are in a wheelchair, and that’s because it is very important for their self-esteem and self-identity to have their appearance and their clothing look good and be reflective of their previous accomplishments and cultural background,” Dr. Herrmann says. Given this expert perspective, it would stand to reason that laundry would rate high on a list of priorities for those working in long-term care facilities. But Armstrong, cross-­appointed to the departments of Global Political Studies and Gender and Women’s Studies at York, says that is simply not the case. Additional problems can occur when laundry is contracted out. Who takes clothes out of the cupboards and who puts them back? It’s an open question. “Not much has been written on the subject before,” says Armstrong, explaining why she felt a need to devote the past eight years of her academic career to scrubbing away at the ignorance that has allowed the grim conditions in nursing homes to fester. Guided by feminist political economy, and informed by theories of care, Armstrong hopes her jointly authored book will effect real change. The future, she says, depends on it. The article, by Deirdre Kelly, appeared in the Summer 2018 issue of the York University Magazine.